These New World Quail have quickly become some of my favorite birds to observe and photograph. I photographed this Male Gambel’s Quail while visiting Bosque del Apache National Wildlife Refuge this winter. They tend to travel as a group, running on the ground. While I was observing them, they seem to have a large male who “herds” and directs the rest of the group to food and away from any sensed danger. The covey seem to eat and carry out their business while the “Look out Male” stands guard. He sends a warning call when danger approaches, such as a bird of prey overhead, and the flock scurries for cover. They are fascinating and beautiful and I may be completely misinterpreting their behavior but it’s fun to presume and wonder. This entry was posted on Saturday, February 15th, 2014 at 9:43 pm. 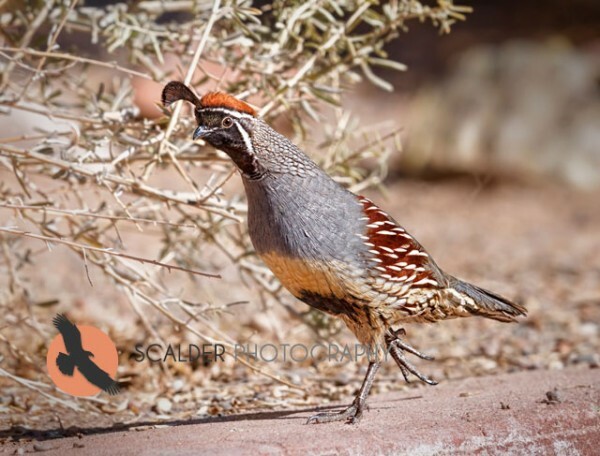 It is filed under Animals / Wildlife, HOMEPAGE MAIN PICTURES, New Images and tagged with bird behavior, bird photography, Bosque del Apache, Gambel's Quail behavior, New Mexico, Quail. You can follow any responses to this entry through the RSS 2.0 feed.